MyMemories Blog: Sunday Designer Challenge!!! Each Sunday MyMemories is going to bring you 2 Designer Challenges! Today's feature Design shop's are Digital Paper Crafts & Happy Scrap Arts! Recently, I took a “field trip” in my own garden and shot several photos all focusing on green. When I saw the color theme “Green,” it was a perfect opportunity to show some of those photos. I like to approach a page as a composition first and make decisions about what to include, the colors and element accessories from that standpoint. Sometimes, that means I have to leave more out than I put in, but to me it makes a stronger visual statement. My first decision here was to choose only three photos, rank them for importance and adjust the sizes accordingly. 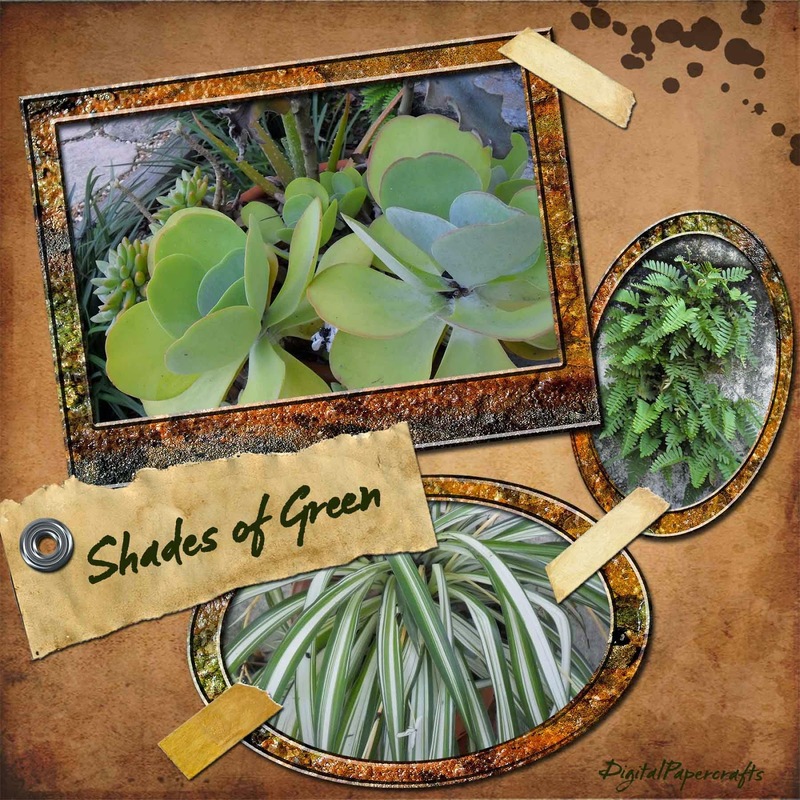 With the images chosen, the paper background and accessory elements are from the “Grunge Distressed Paper Kit.” The brown paper is an interesting and subtle counterpoint to the green plants. The frames are from the “Sunflower Summer Element Set” for more texture and a hint of green to pick up the theme. It sounds simple to say that the photos are arranged in a circular layout but it took several rounds of trial and error before I settled on that arrangement. Then, the paper tag and tapes are placed to reinforce the circular trip around the page. The finishing touch, the title, is simply stated in a font that resembles my handwriting but is far more legible. I love to see the unique and personal ways that people express themselves with MyMemories products and hope this behind the design peek is helpful and fun. I was floating on a buoy, which was actually a giant donut, and I was surrounded by huge cute seahorses and a few paper boats. Both the sun and the moon could be distinguished in the sky, the moon was represented by a croissant and the sun was a huge half lemon. I wasn’t far away from an island which was actually made of ice cream! There were flashy cocktail umbrellas planted on the beach.